Dutch Low Saxon are the Low Saxon dialects that are spoken in the northeastern Netherlands and are written there with local, unstandardised orthographies based on Standard Dutch orthography. The UNESCO Atlas of endangered languages lists the language as vulnerable. Between 1995 and 2011 the numbers of speakers of parents dropped from 34% in 1995 to 15% in 2011. Numbers of speakers of their children dropped in the same period from 8% to 2%. North Rhine-Westphalia is a state of Germany. The Dinkel is a river in Germany and the Netherlands, left tributary of the Vecht. Its total length is 89 km, of which 47 km in Germany. 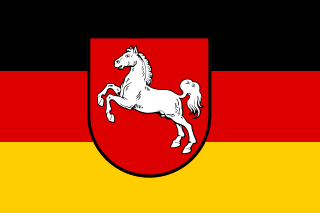 The Dinkel originates in North Rhine-Westphalia, Germany, between Ahaus and Coesfeld. It flows north to Gronau, crosses the border with the Netherlands (Overijssel), flows through Losser, Denekamp, and recrosses the border to Germany. The Dinkel joins the Vechte in Neuenhaus. Losser is a municipality and a town in the eastern Netherlands. It is at the eastern end of the A1 motorway. The Archdiocese of Utrecht is an archdiocese of the Catholic Church in the Netherlands. The Archbishop of Utrecht is the Metropolitan of the Ecclesiastical province of Utrecht. 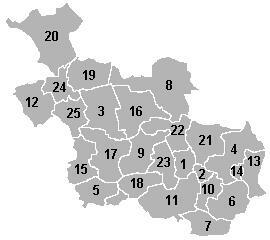 There are six suffragan dioceses in the province: Breda, Groningen-Leeuwarden, Haarlem-Amsterdam, Roermond, Rotterdam, and 's-Hertogenbosch. The cathedral church of the archdiocese is Saint Catherine Cathedral which replaced the prior cathedral, Saint Martin Cathedral, after it was taken by Protestants in the Reformation. Charles V was ruler of both the Spanish Empire from 1516 and the Holy Roman Emperor from 1519, as well as of the lands of the former Duchy of Burgundy from 1506. He stepped down from these and other positions by a series of abdications between 1554 and 1556. Through inheritance, he brought together under his rule extensive territories in western, central, and southern Europe, and the Spanish viceroyalties in the Americas and Asia. As a result, his domains spanned nearly 4 million square kilometres, and were the first to be described as "the empire on which the sun never sets". After a brief occupation by the forces of the Bishop of Münster (1672–74), Overijssel received a new form of government which granted the stadtholders more power. Widespread resistance against the increased power throughout the provinces eventually led to the formation of the Batavian Republic in 1795. A centralist government arose and the Netherlands was organised into a series of départements , based on those used by revolutionary France. At first organised into its own département , it was merged with Drenthe in 1798 to form Ouden IJssel, which was renamed Overijssel in 1801. Enschede, also known as Eanske in the local dialect of Twents, is a municipality and a city in the eastern Netherlands in the province of Overijssel and in the Twente region. The municipality of Enschede consisted of the city of Enschede until 1935, when the rural municipality of Lonneker, which surrounded the city, was annexed after the rapid industrial expansion of Enschede which began in the 1860s and involved the building of railways and the digging of the Twentekanaal. Hengelo is a city in the eastern part of the Netherlands, in the province of Overijssel. The city lies along the motorways A1/E30 and A35 and it has a station for the international Amsterdam – Hannover – Berlin service. Bouches-de-l'Yssel was a department of the First French Empire in the present-day Netherlands. It was formed in 1810, when the Kingdom of Holland was annexed by France. Its territory corresponded with the present-day Dutch province of Overijssel. Its capital was Zwolle. Twente is a non-administrative region in the eastern Netherlands. It encompasses the most urbanised and easternmost part of the province of Overijssel. Twente is most likely named after the Tuihanti or Tvihanti, a Germanic tribe that settled in the area and was mentioned by the Roman historian Tacitus. 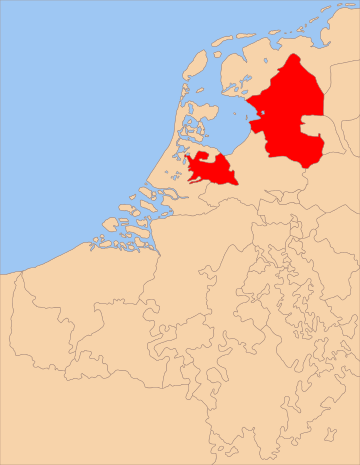 The region's borders are defined by the Overijssel region of Salland in the northwest and west, the German County of Bentheim in the northeast and east and the Gelderland region of the Achterhoek in the south. Salland is a historical dominion in the west and north of the present Dutch province of Overijssel. Nowadays Salland is usually used to indicate a region corresponding to the part of the former dominion more or less to the west of Twente. The Twentekanaal is a canal running through the Dutch provinces of Gelderland and Overijssel, connecting the three largest cities of the Twente region, Almelo, Hengelo and Enschede to the national network of rivers and canals. Because the canal forks to reach Almelo, the canal is officially plural, which is Twentekanalen. Apeldoorn is a railway station in Apeldoorn in the Netherlands. The station was opened on 15 May 1876, on the Amsterdam–Zutphen railway. It was opened when the Amersfoort to Zutphen section was completed. Journey time to Amsterdam is 1 hour, as of the 2017 timetable. Enschede is the main railway station in Enschede, Netherlands. The station opened on 1 July 1866 and is on the Zutphen–Glanerbeek railway. Between the late 1970s and 2001, the passenger service to Germany stopped. The connection to Münster was reopened in 2001. There is no connection allowing the German trains to run any further into Overijssel; however there was before the line closed. Hengelo is a railway station in Hengelo, Netherlands. The station was opened on 18 October 1865 and is on the Almelo–Salzbergen railway and the Zutphen–Glanerbeek railway. It underwent a major renovation in 2010. Almelo is a railway station in Almelo, Netherlands. The station was opened on 18 October 1865 and is on the Deventer–Almelo railway, Almelo–Salzbergen railway, Zwolle–Almelo railway and Mariënberg–Almelo railway lines. The current station building dates from 1962. The train services are operated by Nederlandse Spoorwegen and Arriva. The Arnhem–Leeuwarden railway is a railway line in the Netherlands running from Arnhem to Leeuwarden, passing through Deventer, Zwolle and Heerenveen. It is also called the Staatslijn A in Dutch. The part between Arnhem and Zwolle is sometimes called the IJssellijn. The Apeldoorn–Deventer railway is an important railway in the Netherlands, running from Apeldoorn, Gelderland to Deventer, Overijssel. The line was opened between 1887 and 1888. It is used by long distance trains from Amsterdam, Rotterdam and The Hague towards Enschede and Berlin, and by local services between Apeldoorn and Enschede. The Geldersch-Overijsselsche Lokaalspoorweg-Maatschappij (GOLS) was a railway company that owned and serviced several railways in the Dutch provinces of Gelderland and Overijssel. The company was founded by Jan Willink, a textile producer from Winterswijk, who had created the Borken - Winterswijk - Zutphen railway in 1878. ↑ The region has a NUTS classification of NL21. ↑ "Twenthe, long-term averages, time period 1981-2010 (in Dutch)" (PDF). Retrieved December 29, 2012. Wikimedia Commons has media related to Overijssel .